A reverse mortgage loan typically does not require repayment for as long as the borrower(s) continues to live in the home as the primary residence, pays property taxes and insurance, and maintains the home according to the Federal Housing Administration (FHA) requirements, or until the last homeowner has passed away or has moved out of the property. The amount of equity you can access with a reverse mortgage is determined by the age of the youngest borrower, current interest rates, and the value of the home. Please note that you may need to set aside additional funds from loan proceeds to pay for taxes and insurance. John and Anne are a retired couple, aged 72 and 69, who want to stay in their home, but need to boost their monthly income to pay living expenses. They would like to remodel their kitchen. They have heard about reverse mortgage loans, but didn’t know the details. They decide to contact a reverse mortgage loan advisor to discuss their current needs and future goals. This example is based on Anne, the youngest borrower who is 69 years old, a variable rate HECM loan with an initial interest rate of 4.966% (which consists of a Libor index rate of 2.841% and a margin of 2.125%). 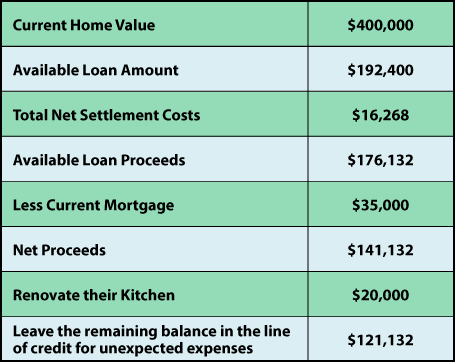 It is based on an appraised value of $400,000, origination charges of $6,000, a mortgage insurance premium of $8,000, other settlement costs of $2,268, and a mortgage payoff of $35,000; amortized over 193 months, with total finance charges of $40,064.67 and an annual percentage rate of 5.46%. Interest rates may vary and the stated rate may change or not be available at the time of loan commitment. *The funds available to the borrower may be restricted for the first 12 months after loan closing, due to HECM reverse mortgage requirements. In addition, the borrower may need to set aside additional funds from the loan proceeds to pay for taxes and insurance. Information accurate as of 03/28/2019.